Mark your calendars to attend the 5th Annual NAMA Boot Camp, August 12-14, in Kansas City! This year’s Boot Camp will kick-off on Tuesday, August 12, at 7:30 a.m. with an optional day-long farm tour. Following the tour, registration for the Boot Camp will open along with a chance to network at the welcome reception. After the reception, enjoy dinner followed by a session on Speed Networking. Wednesday, August 13, begins with breakfast and a general session with a Producer Panel. After the general session, line up for one of two breakout sessions. These breakouts will focus on Serving Niche Markets and New Media. Join us for Economics In Agriculture at a luncheon session after the breakouts. The afternoon will begin with breakouts on A Year in the Life and Little Red Writing Hood and The Big Scary Communications Plan, followed by the final session of the day on International Marketing. Following the last session, join us for more networking at the evening reception. Thursday, August 14, will kick-off with breakfast followed by a general session on Creative in Agriculture, followed by the Boot Camp Closing Session with a Client/Agency Panel discussion. To register for the 2008 NAMA Boot Camp visit, http://payment.nama.org/bootcamp08.htm. If you are interested in sponsoring a session or event at the NAMA Boot Camp, please fill out the sponsorship confirmation form at www.nama.org/programs/bootcamp-spo.htm or contact Jenny Pickett at 913-491-6500 or via e-mail at jennyp@nama.org. For the latest information on the NAMA Boot Camp visit, http://www.nama.org/programs/bootcamp.htm. Make the most of your membership by taking a committee role at the chapter level or national level. Gain hands-on leadership experience that will benefit you in your professional and personal life. Chapter and national leaders are currently recruiting committee members. If you are interested in becoming a member of a chapter or national committee fill out the online form at http://www.nama.org/leader/leaderform.htm or contact your chapter president. A list of chapter president’s can be found at http://www.nama.org/chapters/chapterlist.htm. Note: Chapter Presidents, if you have your leaders already selected for the upcoming 2008-2009 program year, please submit them to Linda Schaefer at the NAMA office at lindas@nama.org. Calendar Reminder: Chapter leaders, regional leader workshops are currently being planned. Stay tuned for the dates of the Regional Leader Workshops. It’s time to begin thinking about who to nominate for the 2008 Professional Development Awards of Excellence. The deadline for submitting nominations is September 1, 2008. 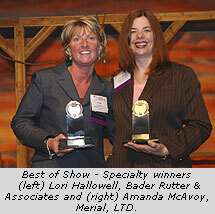 These awards will be presented at the 2008 Agribusiness Forum, November 11-12, at the Hyatt Regency Crown Center in Kansas City. These awards honor NAMA members based on outstanding achievement in each of the Professional Development Areas (PDA): (1) Marketing Communications; (2) Product/Species Management; (3) Public Relations; and (4) Sales. Nominees must be NAMA members. Nominators should target individuals with direct planning and execution responsibilities in the respective Professional Development Area from agribusiness and related companies. The deadline for submitting nominations is September 1. If you have any questions regarding these awards, please contact Jenny Pickett at jennyp@nama.org. To download the nomination form in an Adobe .PDF format, visit http://www.nama.org/awards/PDAapplication.pdf. You can also fill out the form on-line at http://www.nama.org/awards/pdaonlineform.htm. The ABEF hosted its annual Golf Outing during the 2008 Agri-Marketing Conference to help raise money for the Student NAMA Careers Program. 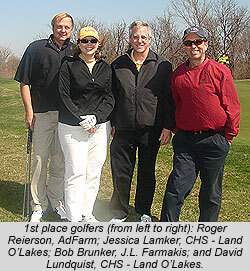 The ABEF Golf Outing took place on Tuesday, April 15 at Falcon Lakes Golf Course in Basehor, KS. This year’s golf outing was the most successful golf outing yet! Taking third place in the golf outing was Jeff Jackson and Sandy Creighton, Farm Progress Companies; along with Doug Newman, VML; and Chet Slump, iNet Solutions Group. Second place went to Lyle Orwig and Mike Opperman, Charleston/Orwig; along with Gary Vorpahl, Hoard’s Dairyman; and Bill Pool, Farm Market iD. First place winners were Jessica Lamker and David Lundquist, CHS – Land O’Lakes; along with Roger Reierson, AdFarm; and Bob Brunker, J.L. Farmakis. Special thanks also to the sponsors of the ABEF Golf Outing: Boehringer Ingelheim Vetmedica, Blasdel Cleaver Schwalbe Communications, Ayres Kahler, Charleston/Orwig, Iowa Farmer Today, John Deere, LEE Agri-MEDIA, J.L. Farmakis, Bock & Associates, Two Rivers Marketing, High Plains/Midwest Ag Journal and DTN/The Progressive Farmer. We look forward to another successful Golf Outing next year in Atlanta! The ABEF Century Club, which was launched at the 2004 Agri-Marketing Conference in Kansas City, raised $3,800 at the 2008 Agri-Marketing Conference. Investing in the club provides the opportunity to step forward and help advance the future of agribusiness. Today’s youth are tomorrow’s leaders and the Century Club support is totally dedicated for investing in scholarships for tomorrow’s leaders. The Century Club’s goal is to have today’s agribusiness leaders contribute $100 for today’s youth. You can be a part of this select group of individuals committed to enhancing the opportunity for tomorrow’s leaders. The list below contains professionals who joined the Century Club by the end of the 2008 conference. Don’t be left out, sign yourself up now! Visit http://www.payment.nama.org/centuryclub.htm. The ABEF Silent Auction and Online Media Auction raised over $27,000 for the Student Careers Program. Items in the auctions ranged from wine to media packages to iPods. Attendees had a chance to win a Dell 50″ High Def Plasma TV courtesy of Penton Media at the 2008 Agri-Marketing Conference. NAMA Student chapters sold tickets in advance as well as at the conference for a chance to win the TV. The winning raffle ticket was sold by Kenny Druckenmiller, Penn State, who sold the ticket to his grandmother, Mary Druckenmiller. Congratulations on the new TV! Over $7,300 was raised from the Student Raffle and schools received $5.00 for each ticket sold, meaning $3,680 of that money will be returned to the student chapters to help cover expenses to next year’s conference. The school that sold the most raffle tickets received $100 and the second place school received $50. In addition, the student who sold the most tickets received an additional cash prize of $100. This year’s top selling school was the University of Tennessee-Knoxville and second place honors go to Virginia Tech. The student selling the most raffle tickets was Jessica Jarrell, University of Tennessee-Knoxville. Nearly 40 Badger NAMA and UW-Platteville student NAMA members converged on Johnson Creek for Badger NAMA’s “Cultivating Your Market: What’s Working in New Marketing Technology” seminar on March 19th. 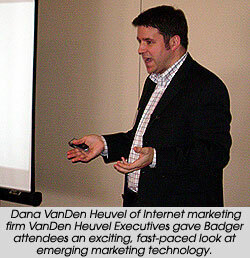 Speaker Dana VanDen Heuvel of Internet marketing firm VanDen Heuvel Executives gave attendees an exciting, fast-paced look at emerging marketing technology, including viral video, podcasting, micro blogging and more. Q&A throughout the presentation gave attendees a chance to get answers to their most pressing questions about new technologies and how best to incorporate them into current marketing plans. 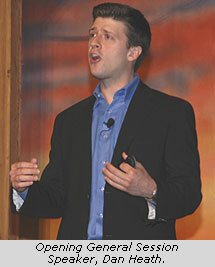 Take a look at some of the things you might have missed at the 2008 Agri-Marketing Conference. View the conference photo gallery at http://nama.org/amc/gallery/index.htm. Special thanks to Denny Eilers, Iowa Photo Farm, for the photo’s! We would like to thank all of our conference sponsors that helped to make this conference a success. We couldn’t have done it without you! For a complete listing of this year’s sponsors visit, http://www.nama.org/amc/sponsor/sponsors.htm. In addition, special thanks to all of the Exhibitors who participated in this year’s Connection Point. For a tour of the trade show visit the Virtual Trade Show at http://nama.org/amc/ts/virtual.htm. If you’re interested in signing up for a sponsorship for the 2009 Agri-Marketing Conference in Atlanta, e-mail Jenny Pickett at the NAMA office at jennyp@nama.org to convey your interest. If you missed taking the Millennium Research survey at the conference, we still want your opinion to help with future programming. Take the survey at http://www.survey.millenniumresearchinc.com/NAMA_onsite_2008.htm. If you still need to complete the Agri-Marketing Conference survey, you can do so at http://www.nama.org/amc/survey.htm. In addition, presentations from most of the conference sessions have been posted on the web site, visit http://payment.nama.org/08amc.html to download the presentations. Best of NAMA Hits a Bulls-Eye! On April 16th, NAMA members saddled up for How the Best Was Won, a western-inspired Best of NAMA celebration of winning agri-marketing campaigns from across the nation. More than 700 people filled the Hyatt ballroom, which was transformed into an authentic wild west scene, complete with music from best-loved westerns and cap guns on every table. The evening began with an impressive overview video to the entrants, followed by “Rooster Cogburn ‘the Ad Man’ Meets His Match” – a comical advertising interpretation of the western classic. Emcees Kyle Bauer, KFRM Radio, and Taylor Brown, Northern Ag Network, presented the Best of Show award in the specialty category to Merial Limited and Bader Rutter & Associates for the Recombitex Vaccine campaign. The Best of Show in the Public Relations category went to Dow AgroSciences and Fleishman Hillard for the Removing Trans Fats from America’s Menus. The Best of Show award in advertising went to New Holland North America and Colle+McVoy for the New Holland Amazing Machine campaign. For a complete list of the Best of NAMA Winners visit, http://www.agrimarketingdigital.com/?i=01-Apr-2008. Special thanks to Farm Journal Media for sponsoring the Best of NAMA Opening Video! Special thanks to Successful Farming/Agriculture Online for sponsoring the Best of NAMA Intro Video! How Well Will Your Next Idea Stick? When Gary Vorpahl of Hoard’s Dairyman magazine and chair of the American Business Media Agri Council, introduced keynoter Dan Heath as a “manic expressive,” NAMA Opening Session attendees didn’t have to wait long to see why the moniker fit. The entrepreneur-turned-best-selling author began by debunking three highly disparate urban legends. Then, once the crowd was nodding, he quickly shifted into the theory that has made him (and his brother Chip) famous: Made to Stick: Why Some Ideas Survive and Others Die. After extensive research in organizational and entrepreneurial behavior, the Heaths concluded that there are similarities in the way ideas are designed that predispose them to succeed. They’ve narrowed these patterns down to these common traits: the stickiest ideas are Simple, Unexpected, Concrete, Credible, Emotional Stories. Dan proceeded to demonstrate why not all ideas are created equal … substantiating his hypothesis with anecdotes and examples ranging from medical research to the U.S. Navy to online dating, with a dozen or more stops in between. Along the way, he also sprinkled in a number of hands-on tips, like why you want to “Anchor & Twist” (combine common sense to establish context uncommon sense to attract interest) or how to avoid “the Curse of Knowledge” (assuming everyone has your expertise). It was a highly entertaining, energetic and informative kick-off to the conference program that left delegates thinking about how to present their own ideas a lot more powerfully! Special thanks to American Business Media Agri Council for sponsoring the Opening General Session! 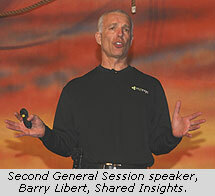 Agri-marketers explore new ways to engage customers and colleagues. Barry Libert, founder and CEO of one of Mzinga’s predecessor companies, Shared Insights, discussed social networking and other Web 2.0 technologies with NAMA conference attendees. Libert stressed the growing importance of interacting with customers, clients and colleagues on their terms, and making them an integral part of a company’s decision making process. Using examples that varied from American Idol online fan clubs to communities created by Dell and GE Healthcare, he explained how drawing upon the creativity and ideas of individuals outside the walls of your organization can lead to innovation and increased profitability. Libert urged listeners to radically redefine the concept of “company” to include anyone interested in sharing ideas and contributing to an organization’s progress. Throughout his discussion, he emphasized how simple it is to take organizations from “me” to “we.” He said everyone has a basic psychological need to share opinions and feel they’re valued. “It’s profoundly human to be heard and give back,” Libert stated. He believes the principle of thinking and behaving with “we” in mind can be used to improve both personal and professional relationships, while making companies stronger in the process. Much of Libert’s discussion was drawn from the book he helped co-author with 4,000 other people using wiki-based contributions, We Are Smarter Than Me: How to Unleash the Power of Crowds in Your Business. Special thanks to John Deere & Syngenta for sponsoring the Second General Session! With that candid admission along with a heartfelt, personal story, three-time bestselling author Mary LoVerde commenced the Closing Session of the Agri-Marketing Conference on April 18, 2008. LoVerde, an internationally recognized life balance expert, described the experiences that led her to a career change and what she discovered brings life’s true happiness: connections. Connections with yourself. Connections with family and friends. Connections with colleagues and clients. “When you can’t keep up, connect!” she insisted. LoVerde believes much of today’s workforce is disconnected and exhausted. 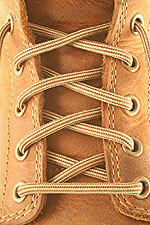 Life balance benefits, she asserted, will be the single most important recruitment tool in the years ahead. In addition to making more connections, LoVerde advised the audience to establish meaningful rituals that provide stability and predictability. She encouraged the audience to plan for romance, which includes embracing the language, art and beauty around us all. “Our legacy will not be a stack of completed to-do lists,” she said. Peppered with inspiring and humorous anecdotes, LoVerde’s session was greeted with roaring laughter and applause. Special thanks to the Cattlemen’s Beef Board and Elanco Animal Health for sponsoring the Closing Session!